Officials in the City of Buffalo, as well as leaders of the local Hispanic community, are praising the public for its generosity so far in the effort to collect aid for hurricane victims in Puerto Rico. But supplies are still badly needed, and a network of drop-off sites will remain available through the end of next week. The Belle Center on Maryland Street is serving as a collection site for hurricane relief goods. 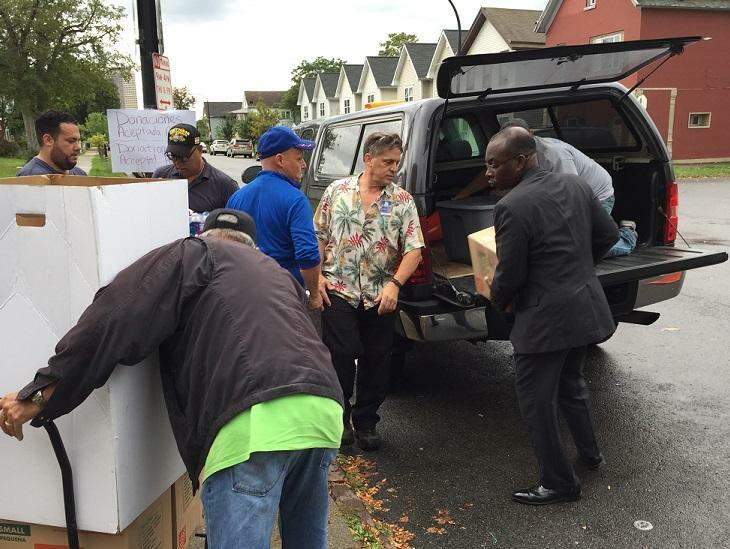 Buffalo mayor Byron Brown helps unload a vehicle outside the Belle Center, where donations are being collected to support hurricane victims in Puerto Rico. 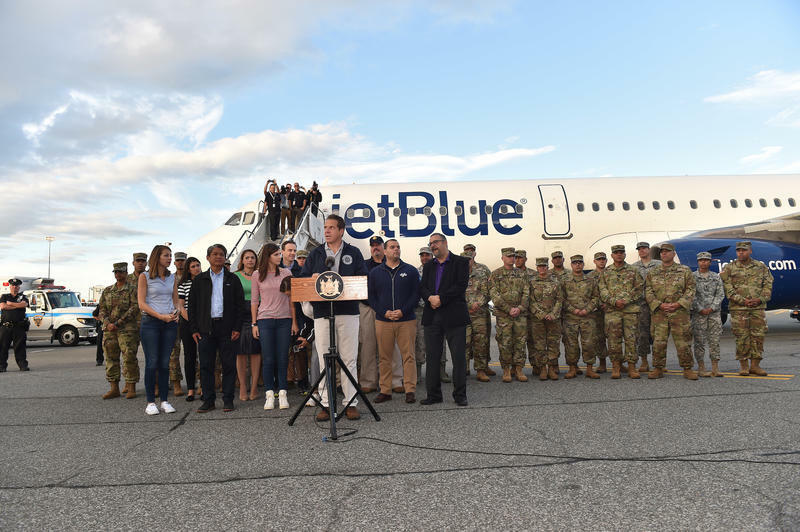 Officials explained that once items are collected, they will be taken to the Connecticut Street Armory, from where New York National Guard members will then transport the goods to Puerto Rico. "The love that the community has shown us has been absolutely, absolutely great an overwhelming," said Lucy Candelario, executive director of the Belle Center. The local drive will continue through Friday, October 6. Items sought include bottled water, batteries, flashlights, dry and canned food items, protein bars, baby wipes, baby formula, diapers, feminine hygiene products, pet foods, blankets, tarps, portable radios and portable lanterns. Clothing and perishable food items will not be accepted. As of Friday, September 29, an estimated 100,000 gallons of water, 3,300 packages of toiletries and more than 1,600 pounds of food have been collected to benefit the people of Puerto Rico. 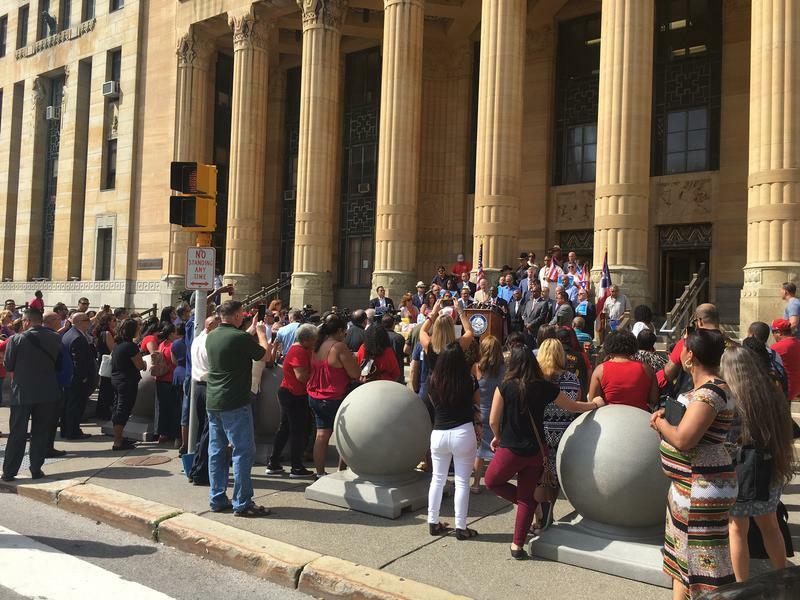 "It's emotional," said Oswaldo Mestre, director of Citizen Services for the City of Buffalo. "We have people coming and driving from Gasport, from Alden, from Eden, all the way here." Several drop-off sites are available, including City Hall, all Erie County buildings, Erie Community College and St. Anthony's Church in Lackawanna. An operation similar to the one set up in the Belle Center has been established in the City of Dunkirk to coordinate donations in parts of the Southern Tier. "Dunkirk is taking care of the Fredonia, Jamestown and Olean area," said Casimiro Rodriguez, Senior, president of the Hispanic Heritage Council of Western New York. Cash donations are also desired. M&T Bank has established an account where money may be donated. Checks may be made payable to the Puerto Rico Hurricane Maria Relief Fund. Donations to this fund are tax-deductible. A GoFundMe account has also been created to accept cash donations. Local corporate leaders are being urged to consider cash donations to help keep local relief operations moving. Millions in Puerto Rico remain without basic needs including running water, power and fuel. But local community activist Chito Olivencia says a few Buffalo-area residents with loved ones on the island have been able to make contact. "If we're getting to the local emergency services in the different towns, it's a lot easier for them to contact these people and that message has gotten out," said Olivencia. Meanwhile, Buffalo mayor Byron Brown and local Latino leaders offered a reminder that Puerto Ricans are United States citizens. Brown sent a message to those displaced following Hurricane Maria: his city will welcome you. "People come back and forth to Buffalo from Puerto Rico all the time. We have a very large Puerto Rican community here in Buffalo," the mayor said. "We are available. We are ready. We are willing to take anyone from Puerto Rico that wants to come here to Buffalo, temporarily or permanently." New York State, home to more than 1 million people of Puerto Rican background, is sending a lot more than thoughts and prayers to the hurricane-ravaged island. Gov. Andrew Cuomo is in Puerto Rico, assessing damage after hurricane Maria and bringing some initial supplies to the country. Cuomo spoke just before taking off from JFK airport in a fully loaded plane provided by Jet Blue. The City of Buffalo is teaming up with the region's Latino leaders to launch a "Puerto Rico Hurricane Maria Relief Fund" drive. A large crowd turned out on the steps of City Hall Friday afternoon to mobilize the community. Power is out across all of Puerto Rico after Hurricane Maria’s passage. Here & Now‘s Robin Young talks with Miguel Santiago (@Johstean) of Radio Universidad de Puerto Rico about what he’s hearing and seeing. 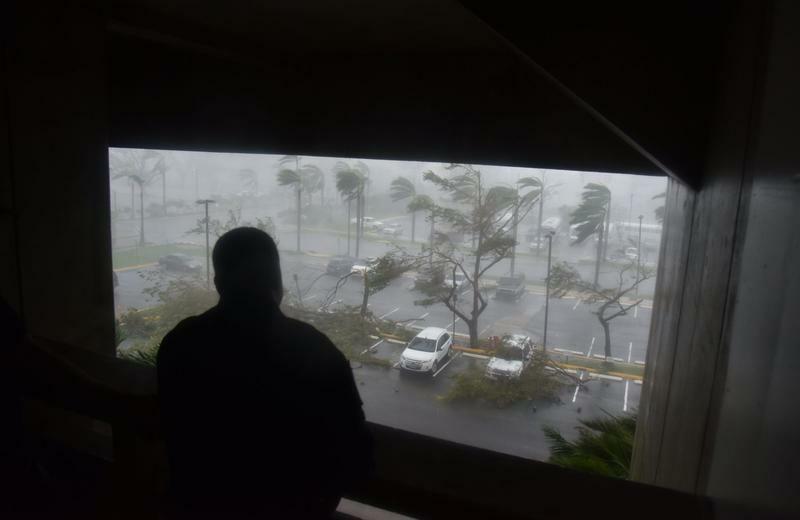 Hurricane Maria made landfall in southeast Puerto Rico this morning, with winds gusting up to 155 miles per hour. 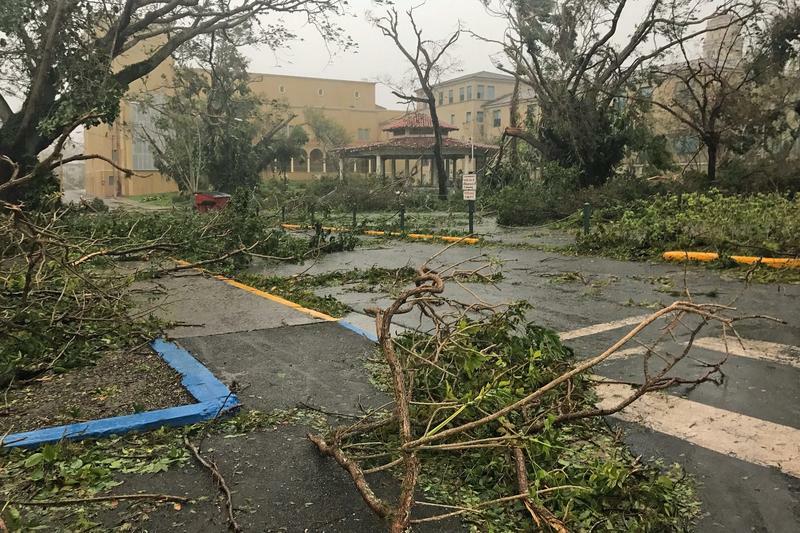 Here & Now‘s Jeremy Hobson talks with Associated Press reporter Dánica Coto (@danicacoto), who is riding out the storm in Puerto Rico.